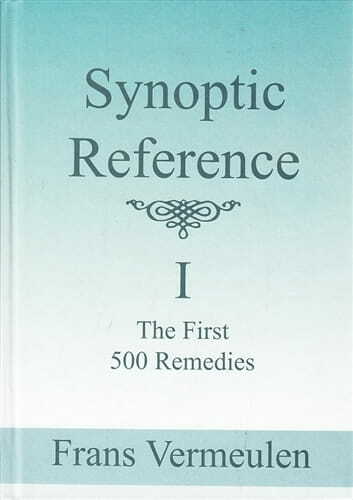 Sure to become ESSENTIAL to study and practice, the Synoptic References 500 remedies have been carefully selected, and range from the traditional, to the new. Some are well-known polychrests, while others are rare. All are presented with a host of useful information. Moreover, some remedies do not appear in an appreciable way in any other materia medica. The book is formatted to reflect 274 Plants, 132 Minerals, 64 Animals, 18 Nosodes, 10 Fungi and 2 Imponderables. This mirrors the proportion of kingdoms and groupings in the homeopathic materia medica. The plant kingdom is by far the largest, followed by minerals and then animals. The extensive Source and Substance section includes the latest scientific names, as well as accurate and up-to-date placement in the appropriate kingdoms or groupings. Characteristic features are described that enable prescribing on, and comparison with, materia medica, thus clarifying and highlighting the importance of certain symptoms. From the earliest times in homeopathy, connections between symptoms, and qualities of substances have been noted and incorporated in remedy pictures. This has allowed for a refinement in 'source-based prescribing,' which most fully acknowledges and utilizes such connections. The Materia Medica is subdivided into 4 Sections, which are Mind, Generals, Sensations and Locals. The sections contain individualizing characteristics and key symptoms. They are derived from both clinical and proving symptoms for a balanced approach. Repertory rubrics are up-to-date, being derived from the Synthesis Repertory in the Radar OPUS program. Additional information is obtained from a wide variety of international Materia Medicas. A completely new feature, the PLUS GROUP consists of several distinctive characteristics or symptoms that define the remedy. Generally, the most distinct quality is listed first. With each added symptom, the possibility of this being the desired remedy increases. For example, the first line plus the second line makes the remedy more defined. Add the third line to the other two and that makes it even more likely that this remedy is correct. The more lines of the group are added 'plus' by 'plus', the more confident one can be that the remedy fits the patient. The latest edition of the Synoptic series is a pleasure to read. Here is a reference book of new, old, polychrest and small remedies with an introduction written in an engaging style. It is full of anecdotes about at least one remedy from each family to whet the appetite. Why do Argentum nitricums burp loudly, or Ginkgo biloba has a delusion of being old? Read the book! Frans has tried to go back to sources, to original provings and well-regarded clinical authorities from all centuries. Affinities, mentals, generals, locals and sensations are listed, with a long section on the rubrics strange, rare and peculiar and another on foods and fluid. Finally there are several "distinctive symptoms and characteristics which define the remedy" which crowns the information really well. The introduction also lists remedies by family but the book is alphabetical in its arrangement. I decided to study some well-known remedies, which I thought I knew well. Little did I know that there is still more to read about Sulphur, "Omnipresent, multiform, super-reactive and versatile [or so he wants to believe]"writes Frans, combining the reality of the chemical with the delusion of the character. I had not realised that Calcarea carbonica steals money. I studied some small remedies that have recently been prescribed for me, Ginkgo biloba for example, about which I could find very little until I read the details here. Frans claims he has gone back to original sources, perhaps it is unfair to find more as it is an impossible mountain to climb: I looked at the original proving of Lyssinum by Hering, to better understand the desire for chocolate which is now so common in our over-sweetened diet. "Aversion to drinking water, but can take small quantities of chocolate" is the description in the appetite section of Hering's Guiding Symptoms. There is no desire for chocolate but another aspect of hydrophobia and the chocolate is drinking chocolate. Another problem is his sources: Frans is conscientious in naming his sources at the end of the introduction to every remedy and uses an initial to reference the sources in the text. But while he names the authors he does not reference the full title or journal or date so for Lyssin he references Klein as a modern clinical source [K] but no more detail. So it is quite hard even with a computer, to trace the reference. I suggest that an online file is created for the full bibliography on the lines of the helpful reference sources created for Plants, www.plant families.net. He explains that he has accessed both the Synthesis and Complete Repertories, which also cite their sources in detail. I really have no real doubts about the reliability of this book compared with so many classic abbreviated texts - it is just the role of a reviewer to find a flaw and hopefully entertain the reader in the style of the original author. Despite the very few shortcomings this new book is surely destined to become a modern classic. Every homeopathic home should have one. I have definitely decided that I shall look at this book before I look at Clarke for any remedy which is present here, and that is a huge leap for me.